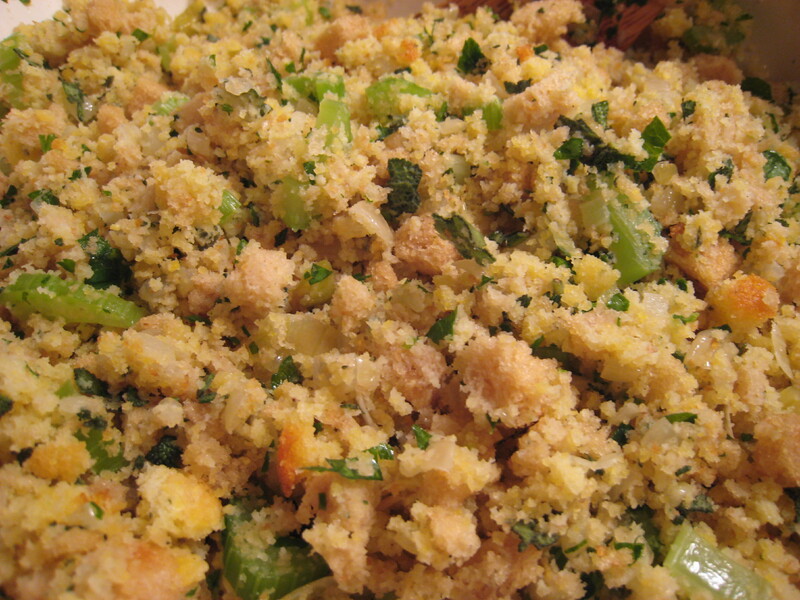 Every Thanksgiving, I try a new recipe for stuffing or dressing. I’ve done it all — wild rice, pears and butternut squash, pancetta and chanterelles, sausage and fennel — and every year I’m happy, but never thrilled with the result. In pursuit of a recipe that I can love and look forward to making every year, I decided to go very traditional this Thanksgiving: sage and onion. I adapted this recipe from one originally published in 1975, and republished in Gourmet Magazine (RIP) in 2002. It calls for a whopping cup of butter! That’s two whole sticks! As much as I love butter, I really thought the amount was excessive; I wanted light and fluffy dressing, not greasy, leaden bread. I also swapped the requested amounts of bread. I like cornbread stuffings, so instead of the asked for 8 cups of white bread and 4 cups of cornbread, I opted for 8 cups of cornbread and 4 cups of white bread. Don’t worry so much if it ends up being something more like 7 and 5, or 6 and 6. As long as you have a total of 12 cups of bread crumbs, it will be fine. Gourmet’s recipe calls for you to make your own buttermilk cornbread. I suppose you could just use store-bought cornbread, but the recipe they recommend is so easy and fool-proof that I strongly urge you to try it. It makes a tremendous difference in flavor. I think that in assembling the dressing, you could even reduce the amount of butter even more without any reduction in luxury of taste. I ended up using more stock than specified in the original recipe. I would say add a cup, and then more stock a little bit at a time, until the dressing is as moist as you would like. The recipe didn’t call for the addition of any cheese, but I think a good cup of Parmesan would go well here. 2. Spread all the bread crumbs out in 2 shallow baking pans and bake until dry, about 15 minutes total. 3. Briefly cool the crumbs in the pans and then transfer them to a large bowl. Stir in the parsley, sage, salt, and pepper. 4. Melt the butter in a large heavy skillet over moderate heat. Add the onions and cook until the onions are softened, about 8 to 10 minutes. Add the celery and cook for about 5 minutes. Transfer the vegetables to the bowl with the crumbs and toss well. Add the eggs, stock, and cream and toss well. Transfer the stuffing to a buttered, shallow baking dish. Bake, covered, in the middle of the oven for 30 minutes, then uncover and bake until browned, about 30 minutes more. You can assemble the stuffing 2 days ahead. Chill it covered, unbaked. Bring it to room temperature before baking. If reheating or baking later, you might want to sprinkle some more stock over the stuffing before putting it in the oven. 2. Whisk together the flour, cornmeal, baking powder, baking soda, and salt in a large bowl. 3. Whisk together the buttermilk, eggs, butter, and sage in another bowl. Add this mixture to the flour mixture. Stir everything until just combined. Spread the batter evenly in a buttered 8-inch square baking pan and bake in the middle of oven until golden, about 25 minutes. 4. Cool the pan on a rack. Once cooled, coarsely crumble the bread. The corn bread can be made and crumbled up to 3 days ahead, and kept in a sealed plastic bag at room temperature.